Lawyers across the nation do tons of pro bono work, but they do it voluntarily. Not a single state mandates pro bono service as a condition of staying licensed to practice law. A handful of states—California, Illinois, Ohio, Oregon, and Texas—don’t have any version of Rule 6.1. However, Illinois and Texas say in the the preamble to their ethics rules that lawyers have a responsibility to provide public interest legal services. And in California, an aspirational statement about pro bono service appears in a comment to the very first rule in a set of proposed professional conduct rules pending before the state supreme court. State versions of Rule 6.1 vary in their approach to hourly goals. 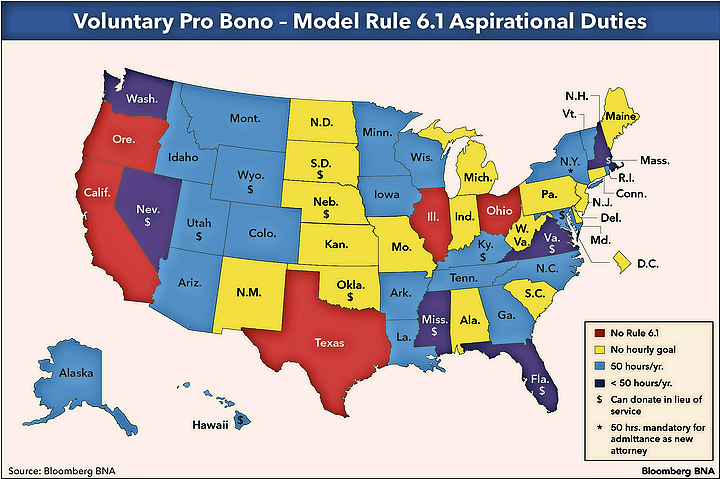 In 21 states, Rule 6.1 calls for 50 hours of pro bono service. In seven states, Rule 6.1 names a lower hourly goal. Eighteen states don’t have any specific time goal in Rule 6.1. But one of those states—New Mexico— has a separate court rule that urges lawyers to provide 50 hours of pro bono service in fulfilling their responsibility under Rule 6.1. A couple of states refer to hourly goals in a comment to Rule 6.1. A comment to Indiana’s Rule 6.1 mentions the state bar association’s aspirational 50-hour goal, and a comment to the District of Columbia’s Rule 6.1 commends the 50-hour goal adopted in certain judicial conference resolutions. In some other states, the bar has adopted an aspirational time goal. For example, the California State Bar’s urges lawyers to provide at least 50 hours of pro bono services each year, and the Michigan State Bar asks lawyers to do 30 hours of pro bono annually or make other specific contributions. In many states, Rule 6.1 say lawyers should voluntarily contribute financial support in addition to providing pro bono legal services. New York’s Rule 6.1 is unique in setting out a specific formula for determining this aspirational financial contribution. In a modest number of states, Rule 6.1 allows lawyers to donate money in lieu of performing services. This group includes Hawaii, Kentucky, Massachusetts, MIssissippi, Nebraska, Nevada, Oklahoma, South Dakota, Utah, Virginia, and Wyoming. State policies on reporting pro bono services vary widely. According to an ABA chart, more than half of the states have no reporting policies; a baker’s dozen have voluntary reporting; and nine states have mandatory reporting. Copyright 2017, the American Bar Association and The Bureau of National Affairs, Inc. All Rights Reserved.